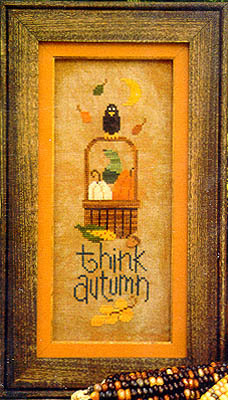 Take a tall look at Autumn with it's pumpkins, squash, corn, and colorful Fall leaves. Model stitched on 28 Ct. Fossil cashel linen from Picture This Plus with Gentle Art Sampler Threads (Forest Glade, Fragrant Cloves, Gold Leaf, Harvest Basket, Mulberry, Shaker White, Shutter Green) and Weeks Dye Works (Amber, Chesapeake, Hazelnut, Molasses, Onyx, Seaweed). Stitch Count: 38W x 121H.